Controller automates deploying computing and network resources to support application instances on multiple fault domains (server racks) to prevent a single point of failure. 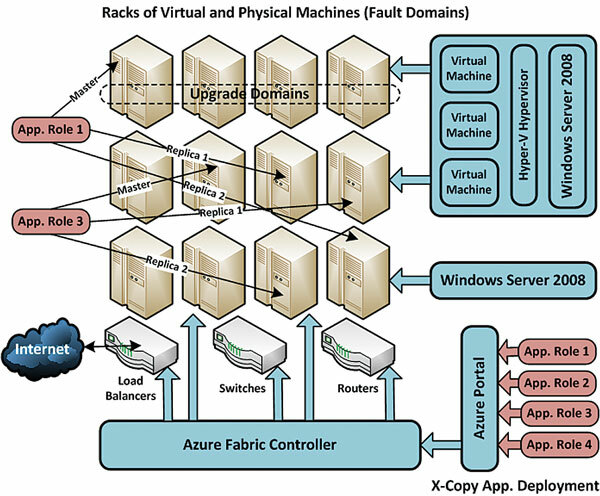 Instances run on nodes, which usually are virtualized Windows 2008 Servers but can be physical machines; Azure currently maintains a master and two replicas of application roles. XCopy application deployment simplifies adding new or upgrading applications. Rolling upgrades or service releases only affect a single update domain at a time to prevent application downtime. Unlike Amazon and Google services, Azure offers an intermediate Staging deployment for new apps that developers can test with a private URL, then deploy to the account's public Production URL (see Figure 6).